154180 at the Boneyard in early 1987 before she moved to her home at the MUSEUM OF FLIGHT, SEATTLE, WA. 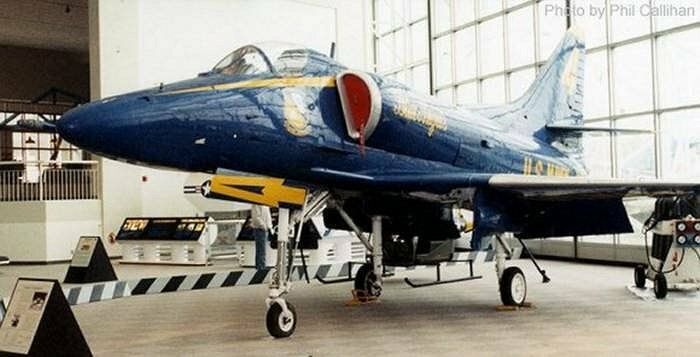 Skyhawk, number 154180, was built by Douglas as its Long Beach, CA plant. The plane was delivered sometime in late March, 1967 (the A-4F Weights and Balances Manual lists the assignment date as 24 March, while the airframe history in the logbook lists acceptance date as 31 March). From the Douglas plant, the plane was ferried to the Long Beach Naval Plant Representative Office. 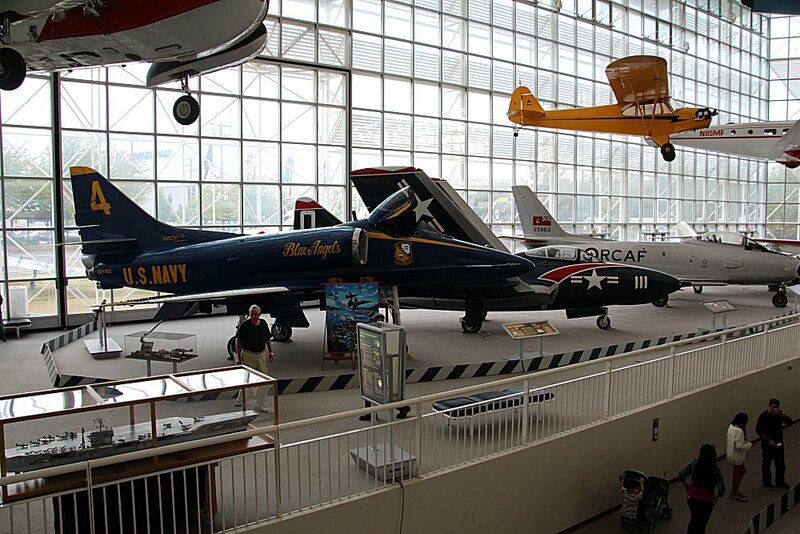 From the NAVPLANTREPO, it was transferred to Chief of Naval Air, Pacific, VA-125, Lemoore, CA on 21 May 1967. VA-125, an attack squadron, was stationed at NAS Lemoore for the duration of 154180's time of squadron. It switched to A-7s in 1969. (Note from Tom Bispo: VA-125 is an attack training squadron. The squadron transitioned from A-4s to A-7s). On 11 September 1967 the aircraft was transferred from VA-125 to VA-93 for service. It is unclear what the nature of the service was, as I was unable to fine a mention of it in the logbook. VA-93, an attack squadron, was also stationed at NAS Lemoore. The squadron was deployed in Viet Nam previous to, as well as after, the period of 154180's service. On 16 December 1967, The aircraft was transferred from VA-93 to VA-23. On 19 January 1970, the aircraft was transferred from VA-23 to VA-22 for service. This service could possibly be the actions listed in the log under 8-22-70, where a number of parts on the aircraft were either repaired or removed. According to a letter from Harry Gann, Manager of Aircraft Information at McDonnell Douglas ( in the MOF files, VA-93, VA-23, and VA-22 were all stationed at NAS Lemoore. Gann also believes the aircraft saw service in Viet Nam. VA-22 (later VFA-22) was deployed aboard the USS Bon Homme Richard (CVA 31) in the Viet Nam theater from 02 April 1970 to 12 November 1970. Presumably, 1540180 was with the squadron and did see action. VF-43 was a training and service squadron. In the command history for 1975, the squadron states that it had A-4F, 154180. The squadron's history shows that it arrived on 19 December 1975, contrary to the log entry. The squadron failed to submit history reports between 1976 and 1979. By 1980, VF-43's mission had been narrowed to air combat training and out-of-control flight training. 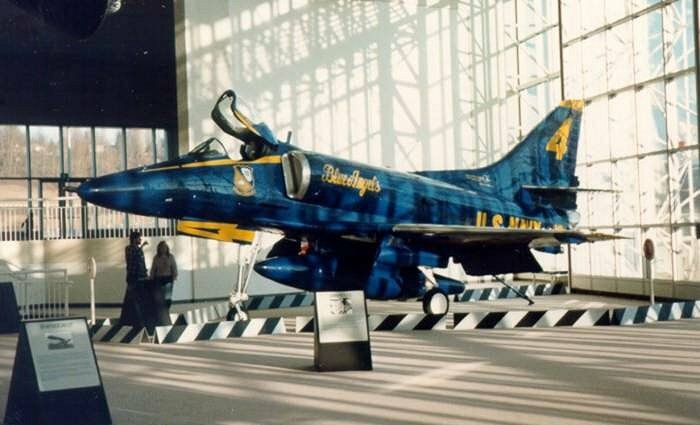 On 23 May 1980, the aircraft was transferred to NFDS (Navy Flight Demonstration Squadron) Blue Angels. Harry Gann says the plane replaced A-4F, 154177, which had an in-flight fire. At this time, the aircraft was listed as having 2773 hours on the airframe. 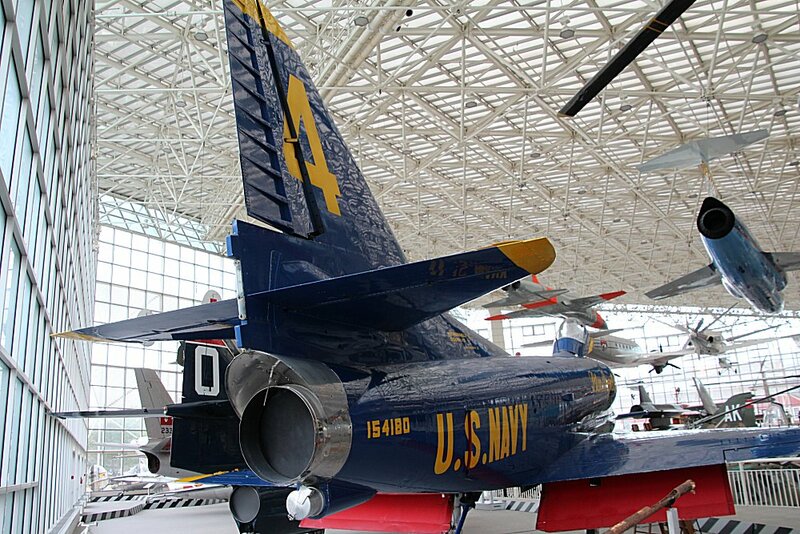 The Blue Angels installed a zero time universal tail when the airframe was modified to the Blue Angel configuration in May 1980. This aircraft was an F model, which carried the avionics "hump" on the fuselage. The hump, along with the guns and armor plating, were removed by the Blue Angels. Also, the leading edge slats were bolted up and a drag chute was added. There was also some control system modifications. These modifications account for the period from May to September 1980 where the plane was not flown. 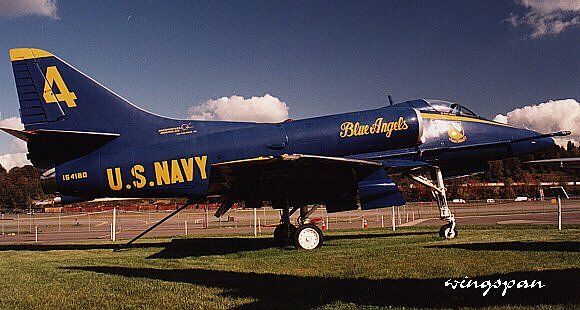 The aircraft was flown with the Blue Angels until November 1986. (Note from Tom: When the Blues began transition to the FA-18) During this period, a "universal wing" was installed on the aircraft (10-21-82). 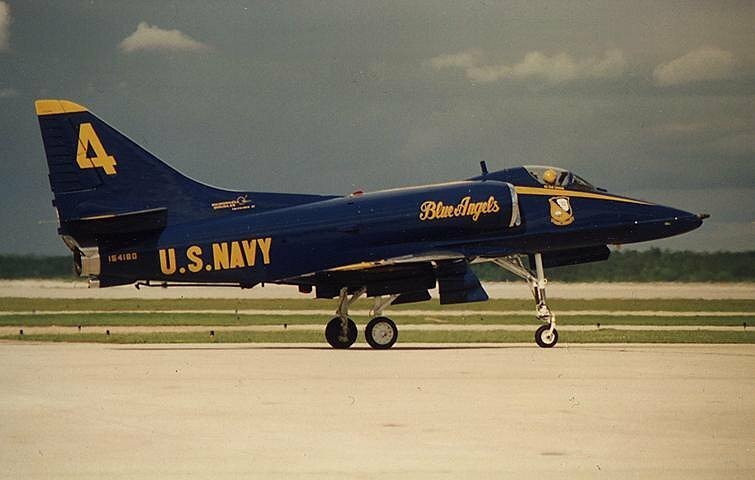 For the most part, only routine maintenance and repair was done on this aircraft, except for a rework nose landing gear on 11-18-85 at NARF Pensacola. The plane was back in service on 12-4-85. 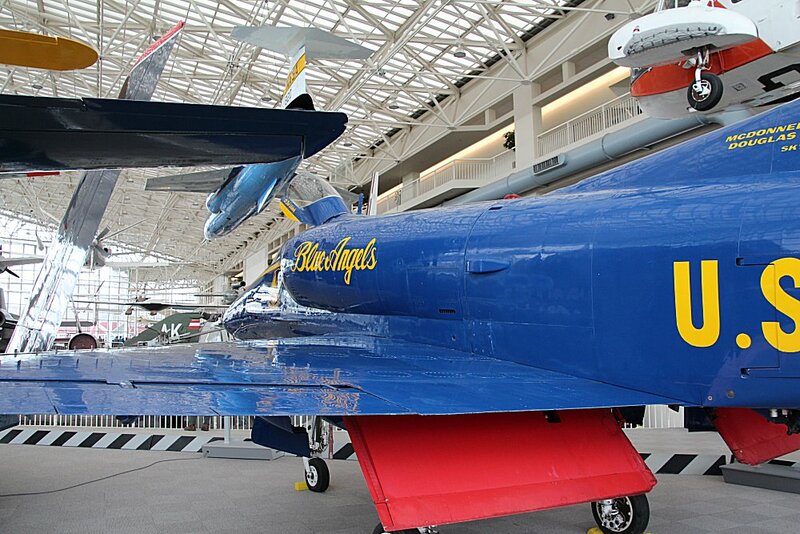 During the tour with the Blue Angels, 154180 flew with a number of different tail numbers. Photos indicate that the plane has worn numbers 2, 3, 4, and 6. According to Gann, because this aircraft had a relatively high airframe time, it was only used in the solo (#6) position for a short time. 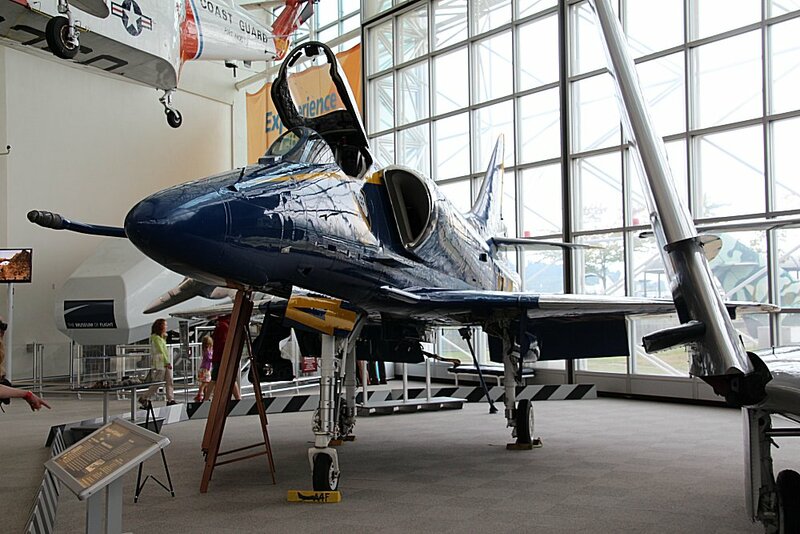 When the Museum acquired the plane, it was painted with number 4, the configuration it retains on static display. 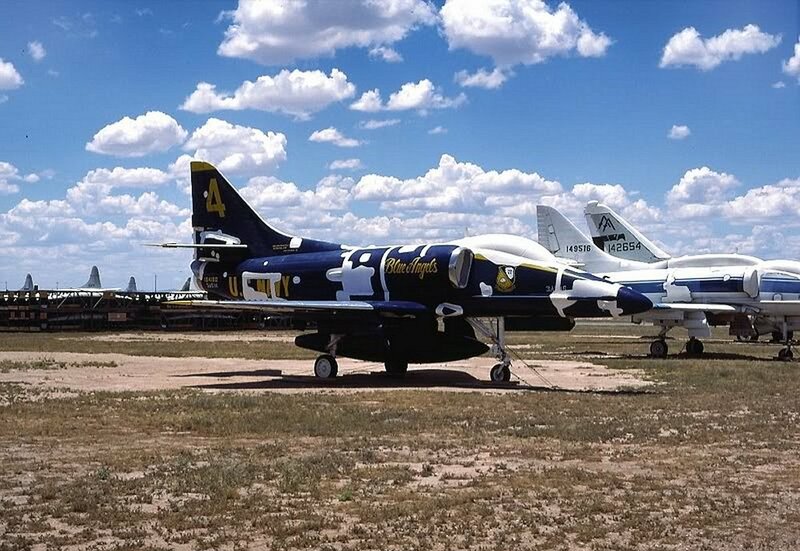 On 11-13-86, the aircraft was transferred to AMARC Davis-Monthan for "storage and disposition". 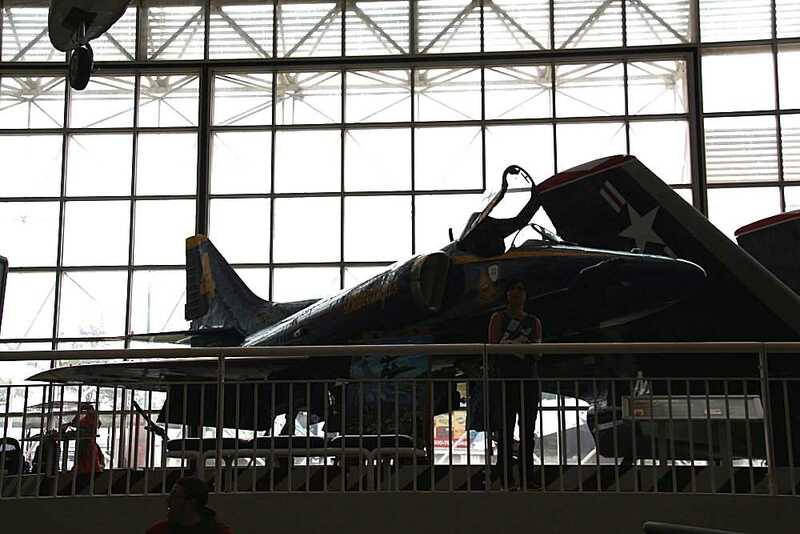 The aircraft's final log entry reads: "19 JUN 1987 ACFT A-4F BUNO 154180 PREPARED FOR OVERLAND SHIPMENT TO THE MUSEUM OF FLIGHT, 904 E. MARGINAL WAY S., SEATTLE, WA 98108 PER WORK AUTHORIZATION DOCUMENT 7362, 19 JUN 1987. ACFT TO BE USED FOR A STATIC DISPLAY. TAIL PIPE AND CENTERLINE TANK TO ACCOMPANY ACFT; ENG REMOVED AND WILL REMAIN AT AMARC." While paging through the stuffed and mounted Skyhawks, I met an old acquaintance in 154180, which is on display at the Seattle Museum of Flight. The accompanying text indicates that it's not known for certain if that a/c actually saw Viet Nam service. If the transfer records are correct, then I can attest that it did. I was OPS Yn in VA-23, 1967-68. Twelve days after 154180 was transferred to VA-23, the squadron deployed aboard USS Ticonderoga from San Diego to WestPac on 28 Dec 1967, and returned17 August 1968. VA-23 was disestablished on 1 April 1970 which accounts for transfer of 154180 to VA-22 in January 1970. A big thanks to BAAA Member Tom Bispo 1964-65 for contacting the Musuem of Flight and obtaining the information and photographs.